I’m a big advocate of donor recognition in the non-profit world. (The same goes for customer loyalty recognition in the for-profit world, of course!) I learned years ago, and it remains true, that a donor doesn’t truly feel thanked until they’re recognized seven different ways. And the number one reason a donor stops contributing to a non-profit isn’t because they start donated somewhere else. It’s because they don’t feel the organization appreciates their support. 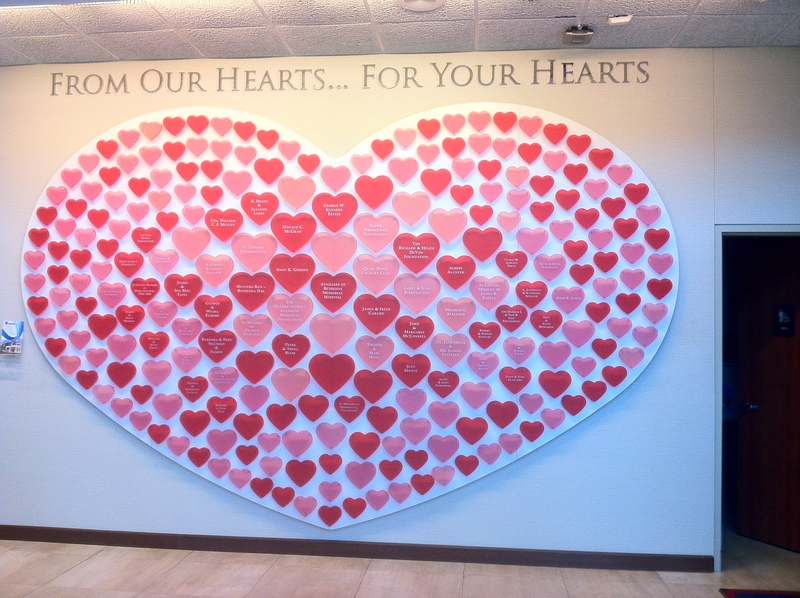 The major donor recognition wall at the entrance of Bethesda Memorial Hospital in Boynton Beach, Florida. On a side note, they saved my grandfather’s life this December after he suffered a heart attack. 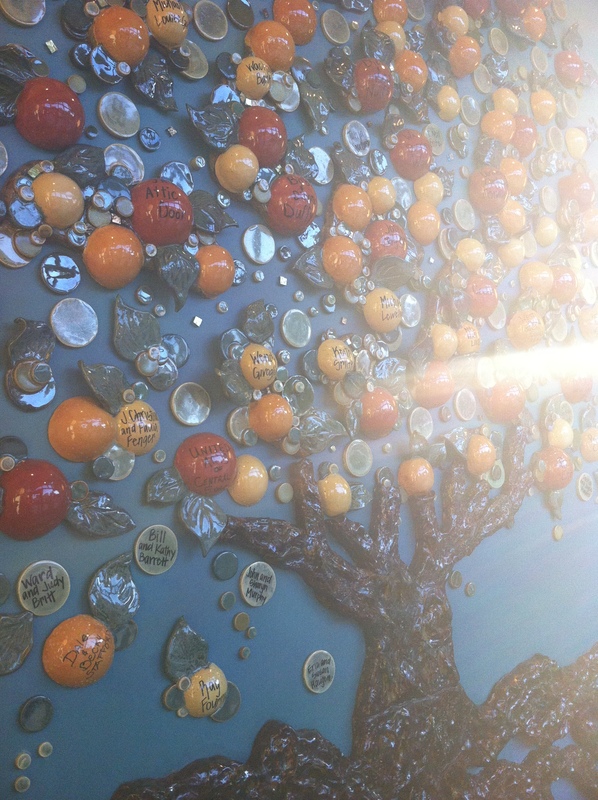 The major donor wall at the Garden Theatre in Winter Garden, Florida. In case you weren’t aware, there’s a strong citrus theme in Orange County. I’d love to hear your ideas: How do you thank your donors? Last year, I was invited by Centers for Animal Therapies to speak on “Fundraising For Your Animal Non-Profit” at Pookie’s RescueFest, located here in Central Florida. The crowd of intelligent, hard-working founders of rescues was incredibly engaged and interested, and I was able to combine my passion of pets and non-profits. This year, I’ve been invited back to speak on “Social Networking to Market and Enhance Your Business,” open not only to founders of rescues but also anyone who has adopted a pet themselves. See below for a short video from last year! After all, how can you NOT love puppies? And, if you’d like to join me in Lake Lily Park tomorrow at 1:30 p.m., you can see the full list of speakers here. Sometimes, my posts offer incredible insights into my life (like this one, right after we lost Janee). Other times, I offer tips on some of my favorite tools (like my post about HARO, HighriseHQ and Mint). But today, as I’m traveling to Las Vegas, I simply wanted to share my most recent published work in Orange Appeal magazine’s “Women to Watch” section. See my piece on Flora Maria Garcia, executive director of United Arts of Central Florida, here. See my piece on Barbara Hartley, executive director of Orlando’s Downtown Arts District, here. Chosen to write these two pieces because of my connections with the Orlando arts community, it was a pleasure to work with both Barbara and Flora Maria. Writing is something I absolutely love to do, so connecting my two passions was a great opportunity to learn from two incredibly influential women. Without a doubt, this increased amount of business travel took a bit of getting used to. I had grown accustomed to staying in town and, most recently, I had been used to working from my home office, enjoying organic snacks throughout the day with a set routine. But, let’s be honest: there’s something exciting about breaking up a regular work schedule with the bright lights of Las Vegas. BYOS. Bring your own snacks. One’s brain, stomach and budget can only survive on the mini-bar and sugary morning danish for so long. My personal favorites include my own stash of herbal tea, apples, peanut butter with crackers and a few protein bars. For others, it’s their own coffee with their favorite creamer. Remain loyal to your hometown time zone. As tempting as it may be, know that it’s just going to be harder to get back in the groove when you return to the office. That series of late nights in Sin City hits harder than you think when returning to the East Coast. Let your staff (and other clients) know of your change in schedule. If you’re going to be generally unavailable for more than a day, make your staff and clients aware of the best way to reach you, even if you think they won’t notice you’re out of town. When you’re new to the role of freelancer, contractor or agency employee, people sometimes forget they have more than just one company to report to. And, let’s be honest, you’ll need to plan ahead with them anyway. Be sure to get a few minutes of YOU time daily. With conferences, client dinners and answering emails in the day’s remaining minutes, it’s easy to go a few days without a breath of fresh air, a walk to clear your head, or a few stretches to your favorite tunes. In order to continue to be productive, make sure you re-group. Have a favorite tip? List it below! It’s no secret we often make New Year’s resolutions around becoming better people. (I blogged about this last year as well… here.) Whether it’s fine-tuning something old or creating something new, volunteering is on the top of that list. Check out my three tips on how to become a star volunteer for the organization you dream about assisting. And, let me know if there’s anything else you would add below! And remember, you can always see more of my published pieces here. Like my blog posts? You can always find more great content when you “like” The Leone Company’s Facebook page here! With a new year on its way, I wanted to share a piece I’ve written, published in an issue of the Winter Park/Maitland Observer last month. And so, this seems like a great time to share the piece. Head on over to their site for the full story and incredible amounts of my wisdom, and let me know what you think below! For a full list of previously published work, head on over here. From time to time, I come across software that I love so much I just have to pass on, like YouSendIt, MailChimp, PDFtoWord, Mint and more. Right now, that software is HighRise HQ. 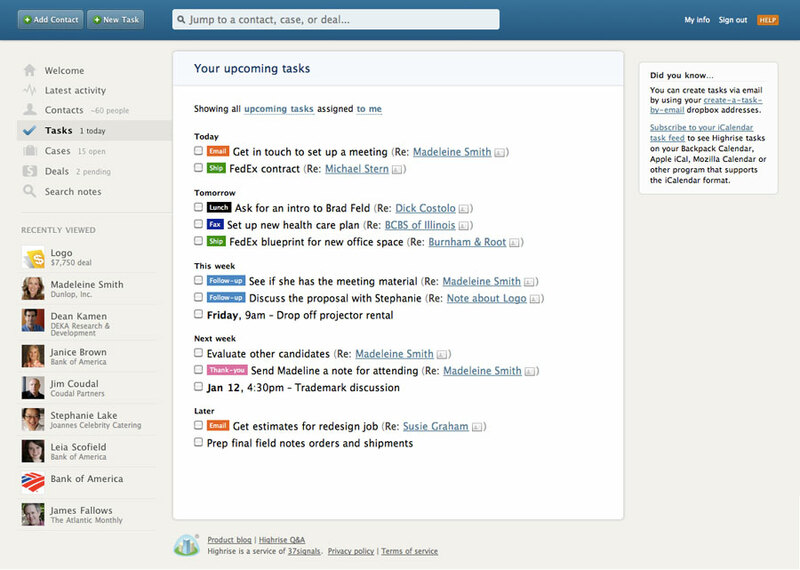 I’ve signed up and adore the task management system. As The Leone Company grows, I need to make sure my “To Do” list stays in check and, after looking from system to system, this one does the trick. It allows me to sort by client or project, by deadline, sends me notification if I’ve passed said deadline (gasp! ), has an app to keep me in check on the go, and far, far more options. There are even features to attach notes to contacts. Score! Check it out here, and let me know your thoughts in the comments section. Do you have a software or productivity tip? I’d love to hear it! As you know, I got my start with Central Florida’s NPR affiliate. (That’s where I met Ani, who I’ve talked about here, when I was interviewed about friendships in the workplace.) Ultimately, that’s where I learned so much of what I bring to the table to day, as non-profits often force young professionals to grow quickly. Through HARO, I saw a press pitch I just couldn’t pass up: a local writer was constructing a piece on friendships in the workplace. While I normally pitch my clients work, I had just the friendship in mind, as Ani is the person I mentioned in this blog post (and this one) as she’s helped with The Leone Company’s growth. The story was picked up at TheLedger.com, and, you can read the full piece here. Tell me: What experience have you had involving workplace friendships? Have you found your partner-in-crime, or wanted to wring someone’s neck instead? Remember: if you’re looking for help with your media pitch, we can help! Send me an e-mail at mara@theleonecompany.com. I’d love to connect.